When I was a teenager, and heavily into my Stevie Nicks/The Mists of Avalon stage, I loved writing poems and songs containing the line..."the dark at the top of the stairs." Wooooo. Spooky! But this isn't that. This is about the mess at the top of my stairs, and the area isn't dark at all, but very bright, considering that this half of the house is all windows and high ceilings. The mess at the top of the stairs refers to my desk, my nook, where I'm sitting right now typing up this post. I have a window beside my desk, and it's cloudy and windy today, and the heavy branches in the pine trees beside our house are waving about. And that's about the extent of the pretty up here: the view out the window. Let's take a tour. I'll meet you as you come in the front door. Well hello! If I knew you were comin', I'da baked a cake. Whoa. Okay. Bookshelf! Ikea Expedit, to be precise. We all sure do love our Expedits, don't we? Lots of squares and storage, not too ugly. But why did I buy it in birch, instead of black? Well, we need to take a couple more steps first. So. I know you're thinking...eh. It's not that bad. Messy, okay, but you've seen worse. Sure. But considering how many hours I spend here during any week, I think I deserve better, and my house deserves better, than this chaotic desk and this vision of...MEH. Beige desk, beige walls. Beige bookcase with burgundy organizers? EEK. And that chair! Which is broken, by the way, and so sometimes I start sloooowly sinking down, feeling like the Wicked Witch in the Wizard of Oz: "Oh, what a world, what a world!" I'm not sure just what I was thinking. To be honest, I haven't applied my same sense of design sensibility of fun and color and contrast to this nook, because it's just...a nook. And a narrow one: at about 46 inches across, it can be tough to find a desk or table to fit the space. But, the nook is where I spend hours and hours of my life. Staring out the window. Shoving aside the piles, scrabbling for a pen. "I know there's one in here somewhere, dammit!" Ain't it pretty? Four lightbulbs up in this fixtures, and these babies are all over the hallways of my house, both up and downstairs. Don't get me started. This wall is supposed to be a gallery of kid-friendly art. Another work-in-progress. All righty, then. Down the stairs we go. Lets pause and admire the Valentine's-themed display on the entry shelves. I leave you with a final image, of the inspiration photo that started this whole ball rolling. Oh, mama. Oh yes, please. I saw this and had a total eureka moment. 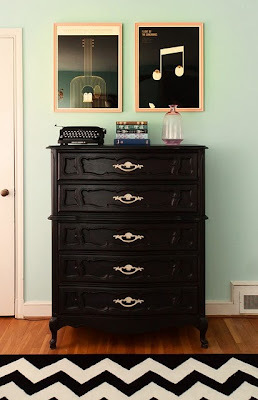 It helps that I have a dresser quite like this (sans the extra decorative molding) sitting rather uneasily in my bedroom right now. After I bust out the sanding paper and black paint, I know the perfect place to put it...right at the top of the stairs. Hola! My name is Kelly. I write about life in my native Southern California and the things I love most: books and the writing life, music, & road trips and daytrips with my family. All writing and photos by Kelly Shire, copyright 2008-2012. All rights reserved. Powered by Blogger.